Chlorinated whitener for white clothes. High whiteness without damaging the garments. High level dirt. Bleaching performance at low temperatures. Suitable for bleaching in hot or cold (max. 60 °C) for white clothes except delicate clothes in washing-centrifugal and continuous processes. 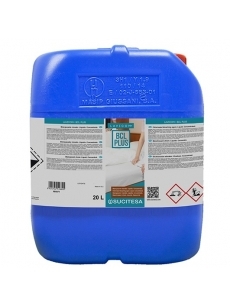 Professional laundry, hospital and OPL, s. Do not use in hospitals or health centers. Dosed manually in the bleaching stage at a temperature below 60 ° C.
Lightly soiled (g/ Kg clothes): 8-10. Normally soiled (g/ Kg clothes): 10-15. Heavy soiled (g/ Kg clothes): 15-20.